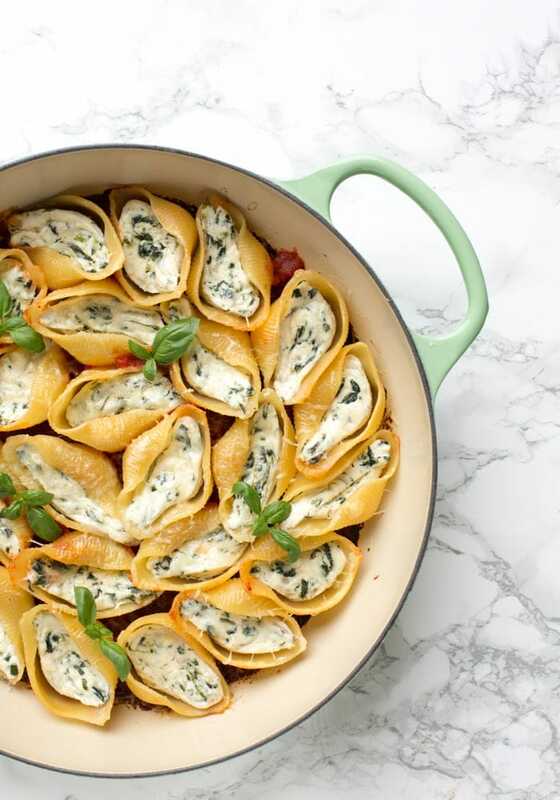 These classic Italian Spinach and Ricotta Stuffed Pasta Shells have all it takes to become a family favourite. Awesomely vegetarian, they're easy and quick enough to make for a weeknight dinner, but also pretty enough to serve at dinner parties and get-togethers. Preheat the oven to 190C / 375F, and arrange a baking tray into the middle shelf. Cook the pasta in a large pot of lightly salted boiling water, until al dente, about 5 minutes. Drain and pat dry on kitchen paper. Meanwhile prepare the filling. Heat the olive oil in a large skillet, over medium-high heat. Add chopped garlic and onion and cook until translucent, about a minute or two. Add the spinach and cover with a lid. Cook for about 4 minutes, stirring occasionally, then season with nutmeg and salt & pepper to taste. Remove from the heat and let cool, then transfer the sauteed spinach leaves on a chopping board and finely chop them. In a mixing bowl, stir together the spinach, ricotta, basil and salt and pepper until thoroughly combined. Transfer into a piping bag and refrigerate until ready to use. Drizzle with a little olive oil the bottom of a shallow large oven-proof casserole dish and spread the tomato sauce all over the base. Stuff each pasta shell generously with the spinach and ricotta mixture, and place in the baking dish. Feel free to pour any remaining tomato sauce over the top of the shells. Drizzle with a little olive oil over the top. Bake covered with aluminium foil for 2 minutes. Remove the foil, sprinkle with Parmesan cheese and broil until the cheese is gooey and lightly browned. Remove from the oven and serve immediately. Store leftovers in an air-tight container in the fridge for up to 2 days. Use a cup of thawed frozen spinach instead of fresh; make sure to squeeze it well to remove any excess water. This recipe makes enough to feed 5 people or 4 hungry ones. I use a large cast-iron casserole pan, but 1 large or 2 medium casserole dishes work just as fine.